The heavy maple sound bars are mounted on a stable fir frame, creating a clean, strong and low resonant sound. Tuned to the D Pentatonic scale. It measures 71cm x 81cm x 25cm. These instruments reach back into antiquity. Originally stone bars were used which were then replaced with wooden bars and much later a resonance body. The resonance body increases the duration of the sound and the volume. The instrument was brought to Africa through East Indian trading people and to Latin America with the slave trade. It is also said that the Celtic people used a relative of the marimbas and xylophones called a Lithophon (litho=stone) and also used an Amadinda made out of wood. 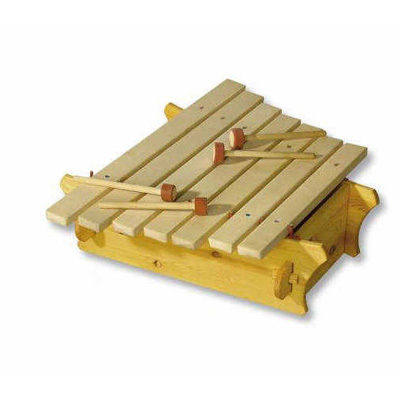 This large Marimba or Amadinda can be easily dismantled for travel and easy transport. The heavy maple sound bars are mounted on a stable fir frame, creating a clean, strong and low resonant sound. Supplied with 2 mallets. Tuned to the D pentatonic scale. It measures 71cm x 81cm x 25cm.